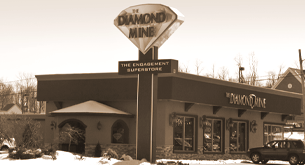 The Diamond Mine first opened it's doors in 1992 in Wappingers Falls, NY in a small 800 sq. ft. location in a strip mall. But it was in 1990 that owners Jeff Chiulli and Robert Demelo started the concept of The Diamond Mine, selling jewelry in High School to friends and family. After high school and with a thriving business, Jeff and Robert decided to go to the famed diamond district in NYC to learn more about the jewelry business and make more connections in the industry. and at the same time growing their jewelry business at home, Jeff and Robert felt it was time to open their doors to the public. 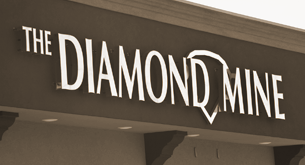 In 1992 The Diamond Mine was established. A short 6 years later in 1998, The Diamond Mine expanded to a 1,500 sq. ft. store in the same strip mall. 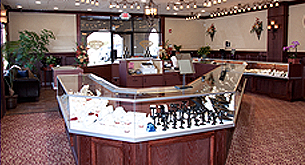 With the expansion of the store came more inventory and a full fledged custom repair shop where Frank, their expert jeweler, could repair, modify, or custom make jewelry for customers. Jeff and Robert always believed in the concept that if you treat your customers right, offer great quality merchandise at great prices in a clean, relaxed environment, then good things will come to your business. After years of searching for a perfect location for a new flagship store, and in keeping with their business motto, in 2009 Jeff and Robert made their greatest investment. With the new store comes once again, a more unique custom inventory, a bigger custom repair shop, and one of the largest selections of custom engagement rings in the Hudson Valley.